BIBN 4096BS is the first potent and selective non-peptide antagonist of the calcitonin gene-related peptide 1 (CGRP1) receptor with IC50 of 0.03 nM and with a Ki of 14.4 pM for human CGRP. 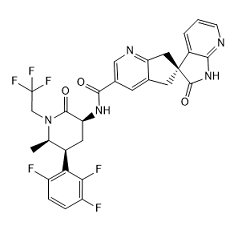 BMS-927711 is a highly potent, oral calcitonin gene-related peptide (CGRP) receptor antagonist with a Ki value of 0.027 nM. 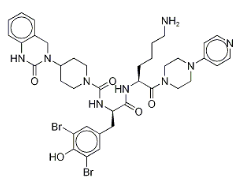 MK-8031, also known as Atogepant, is a calcitonin gene-related peptide receptor antagonist. MK-3207 (Hydrochloride) is a potent and orally bioavailable CGRP receptor antagonist with IC50 of 0.12 nM and Ki of 0.024 nM, and is highly selective versus human AM1, AM2, CTR, and AMY3. MK-0974 is a highly potent, selective, and orally bioavailable CGRP receptor antagonist, which may be valuable in the acute treatment of migraine. MK-3207 is a potent and orally bioavailable CGRP receptor antagonist. In common with other CGRP receptor antagonists, MK-3207 displays lower affinity for human CGRP receptors from other species, including canine and rodent.